'The Affair' is a deliberately slow-paced, beautifully shot, compelling show. 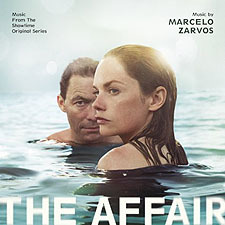 The two main characters recount their truth in regards of the forming of "the affair" with a crime mystery in the background as an excuse to do so. We, as viewers, must decide and deduct our truth from their accounts. Personally, I love the psychological aspect of this show. In fact, it's the main reason for my watching. The soundtrack, 'The Affair: Music From The Showtime Original Series' features the score from the first season of the hit series. Marcelo Zarvos, also the talented composer for the Showtime series 'Ray Donovan', as well as for the upcoming films 'Rock The Kasbah' and 'American Ultra,' has hit it out of the park again here, for sure. The music, all 28 tracks, are sequenced perfectly, each one fitting format style with delightfully with each other. Each composed track tells the story of how the characters "check each other out," trying to step gently, just in case there is a chance that "the affair" can be salvaged. That and the temptations of "the other person," of course. The premise of the TV show is nearly the same: what happens when two people fall in love when they should not. Each chapter is told from one person's POV as Alison and Noah's, and it is as compelling to read, if not more, as there is also a suspense element; as previously noted. Zarvos is tackled a tricky score here, with an "icky" subject matter and enabled us all to musically fall in love.